A Tea With Friends reader in Massachusetts, Jenn, recently asked if she could send me a little something she picked up with me in mind. The thoughtfulness behind such a request already meant a lot to me, and then the package arrived bearing this terrific tin with a Teatime CD! I'd heard of these but never actually seen one "live," so I was thrilled with the gift. I was even more thrilled to learn she had come across this in a consignment store, and when she came across a second one got it for me. Now if there's something I love more than getting a gift, it's getting a gift of thrifty origin. Oooh, how I love that! The CD was brand spanking new, still in the shrink wrap, and when I opened it I was impressed to find that the CD itself looks like you're peering down into a cup of freshly brewed tea. My compliments to the package designer! It is definitely the exception and not the rule, but occasionally antique stores can turn up treasures that are even greater bargains than you find at the average yard sale or estate sale. Such was the case with this $4 plate I came across at an antique mall in Villa Rica on Saturday while antiquing with my mom. This is just about one of the prettiest vintage plates I have ever seen! Upon studying the lacy reticulated borders of this 8-1/2-inch-square plate, I realized this is really not at all some finely painted piece. If you look closely you'll see that the gold painting appears very irregular, and although the overall effect is great, I can't help wondering if this is some homemade ceramic piece of yesteryear. The back also appears a bit rough and unfinished looking, again making me think this is not some mass-produced piece, and therein lies the charm! The rose design appears to be a decal, and there is a signature but since part of it is missing I can't quite make it out. Can you? When I checked out with my treasure, it rang up not $4 but instead just $1.60. I had to ask about the discount, because I surely didn't want to rip them off, but the clerk said that booth was offering an additional 60 percent off. No complaints here! Next we stopped by an antique mall in Bremen, and there I found a booth which had quite a few pieces that were decorated in the style of old-fashioned china painting, this one signed "Louise." It was again a square shape that caught my eye, and when I noticed this piece was slightly elevated I turned it over to see if there was a familiar circular rim underneath. Indeed there was -- this is a square tea trivet! My best "buy" of the day, though, was free. 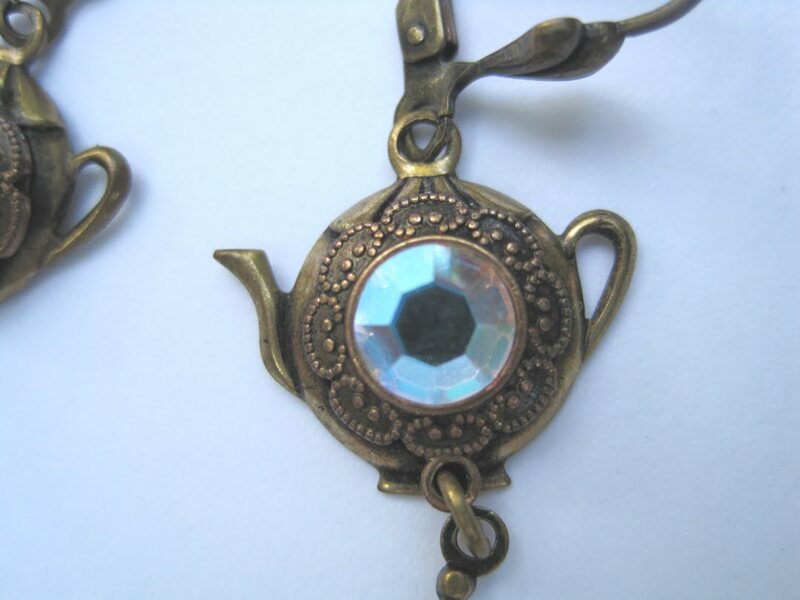 It was this teapot pin my mom had found in a bag of costume jewelry she'd bought earlier in the week. "I thought you might want this," she said, and I certainly did! I've seen this set on eBay a few times but never at a price I liked. 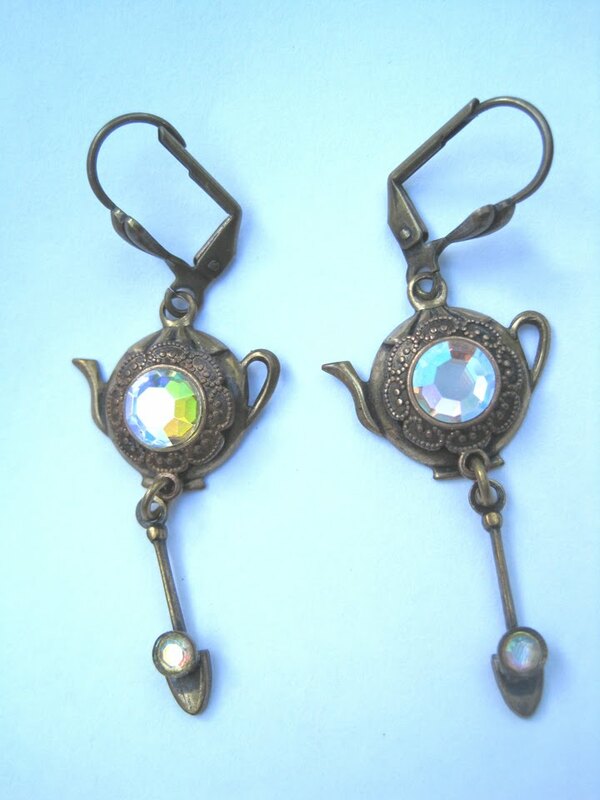 What's so unusual here is that two tiny teapot earrings are attached to the surface of the pin. See them? You can see the backs here. 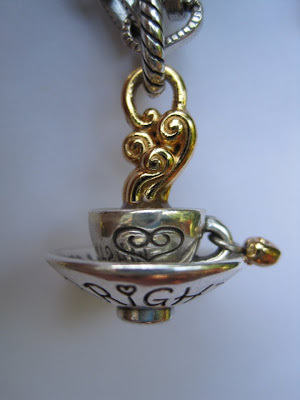 A fun addition to my tea-themed jewelry collection, and there's certainly nothing square about that! 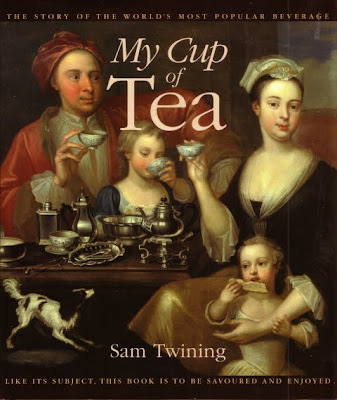 Tea & Books Saturday #35: "My Cup of Tea"
Any serious tea lover is acquainted with the name Twining, and Sam Twining's delightful book about tea is certainly one tea lovers would do well to seek out. I don't know if you have a favorite Twinings tea, but mine is undoubtedly the Earl Grey in the familar golden tin, and it is the Earl Grey by which I judge all others! "My Cup of Tea" is based on the tea lectures Sam Twining has given, and its friendly, chatty tone makes it a particularly pleasant read. For instance, he notes that tea was first imported by the East India Company in 1669 and then says, "The next part of the story is hard to believe. Tea had many enemies, in the form of the clergy, doctors and brewers. The clergy said, as tea came from a heathen country, it was a sinful drink. Doctors said it was bad for you. And far, far worse, brewers lobbied the government and claimed that tea would replace ale at breakfast!" Twining also offered a little more insight into the "raised pinky" symbol that most of us now know is an affected gesture, not a sign of proper tea etiquette. Noting that English ladies had fallen in love with China's translucent white teawares when they hit the market, he says the women were "even being painted with a tea bowl in the hand, held by the thumb underneath and two fingers on the rim, leaving the little finger, the pinky, at an affected angle." If you've ever held a guywan (a handle-less cup and saucer with a lid), it's easy to imagine that pinky sticking out! If you like to see lots of images of teawares, this book will not disappoint. I loved seeing the Worcester tea service from 1795-1800, a set which featured handle-less teacups and also a teapot with its own special saucer. Other items pictured include mote spoons (for unclogging leaves from a teapot's spout) and sugar nips (for breaking off pieces of sugar). Do you know who Anna Maria Stanhope was? I'm not sure I'd ever heard this complete name of Anna, Duchess of Bedford, who gave us the tradition of afternoon tea. She is believed to have introduced the young Queen Victoria to afternoon tea, and the book includes a photo of the queen and her family at tea in 1887. The book winds up way too quickly, and I even enjoyed Twining's final chapter on "How to Make a Really Good Cup of Tea." He says, "Never take sugar in your tea as it numbs the palate and takes away the taste of tea. Change to a fruit tea if you want something sweeter." I found that ironic since I love a little sugar and milk in a good strong cup of Twinings Earl Grey! That small disagreement aside, I greatly enjoyed hearing from a man who is truly a household name in tea! A few weeks ago I "minded the store" one Saturday for my shopkeeper friend Liz while she was away on vacation. I've done this a time or two before and really enjoyed it, and although she certainly doesn't have to, she always gives me a wonderful thank-you gift for helping out at Cydney's Alley! This time my treat was this lovely wooden teabag chest! I've never had one of these before, so I was extra happy with my gift. Until this summer, I had my teabags together in a large glass jar displayed on a table in the kitchen. But then I decided to display seashells in the glass jar, so there went my teabag organization. They're hidden here and there around the kitchen, but now I can have them all together once more. I like that the compartments of this chest are wider than the typical teabag, because I often get oversized teabags and they should fit as well. Do you have a teabag chest? If not, how have you organized your own teabags? 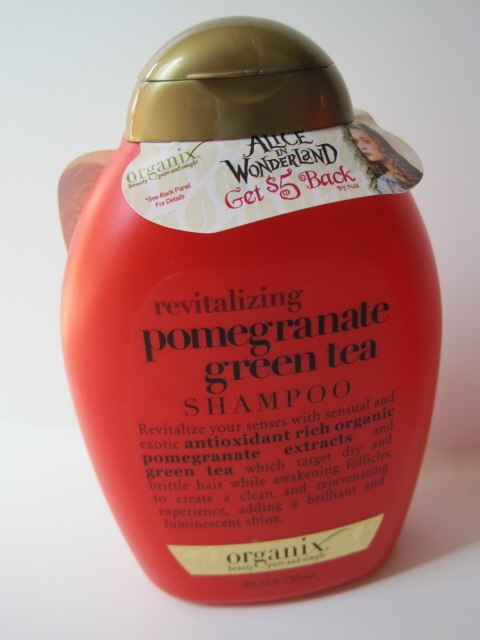 It was time for some new shampoo and conditioner, so this week I decided to try Organix's Pomegranate Green Tea Shampoo and Conditioner. For once, I remembered to check the label *before* checking out, and indeed these products do contain green tea extract. One of these days, I am going to take the time to research what, if anything, green tea does for the hair, but I like the idea of tea being in my hair products and so I decided to give these a try. The shampoo was thick and had a rich lather, and the conditioner had a nice rich texture as well. The pomegranate scent is yummy, though I'm still not sure what I think about food-scented hair care products. Do I spoon some granola on top of the shampoo or do I just use it to lather up my hair? At any rate, I liked the way my hair felt after using these products, even if I did have an odd craving for berries all morning ... Also, if you happen to be an "Alice in Wonderland" fan, you can find a coupon on the shampoo bottle for a $5 rebate if you buy the DVD. 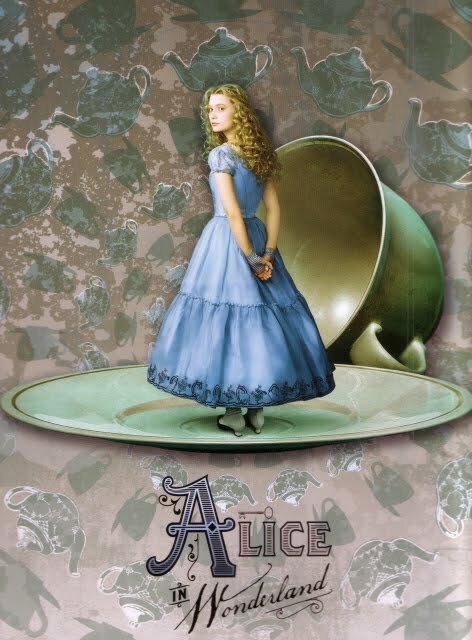 And I actually have one more "Alice" related note for the week. Did you know Alice in Wonderland and The Mad Hatter are two of the Madame Alexander dolls currently being given away with McDonald's Happy Meals? I don't usually have a Happy Meal for lunch, but I did twice this week just so I could get those two dolls. Alas, Alice did not come with a teapot as I had hoped, but fortunately I have a few small ones she and M.H. can play with at their next Mad Tea Party! It's been quite a few years since I've needed to do any genuine back-to-school shopping, but I absolutely love seeing what new papers, pens and pencils they come out with each fall, so this is the season I usually buy my stash of office supplies for the year ahead. This week, I was in Walmart browsing the school supplies when I came across some great "Alice in Wonderland" folders. This design was my favorite because it has both the teacup design as well as the subtle teapots in the background. 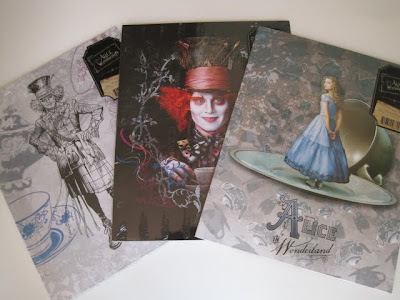 I remembered how much my two oldest nieces loved the Johnny Depp "Alice" movie when it came out, so I bought a few extra packs of folders to share with them since all three of these packages feature a tea-themed folder as one of the two in the pack. 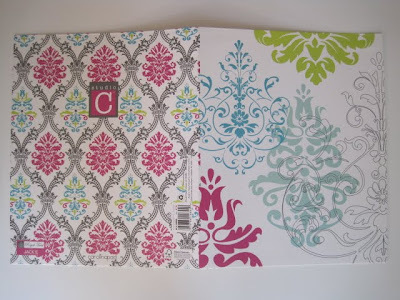 And it's not tea-themed, but I just had to show you the front and back of this damask design folder. Is that not just gorgeous? I don't know what student this was designed for, but I immediately went home and put this lovely folder to good use! I also was thrilled to find these vinyl zip-top pouches for $1. I'd been thinking of ordering some from a quilting supply catalog to hold the quilt pieces I will sew this fall, but theirs were $14 for a set of four, plus shipping. 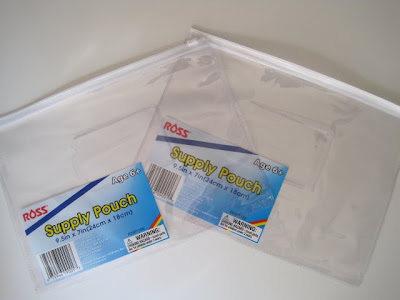 This $2 worth of pouches will do the trick just fine (and I had to share because so many of you are also quilters)! Do any of you buy school supplies for yourselves? If so, please tell me where you've found cute ones this year! I'm not sure exactly *how* vintage these are, because I don't think these leverback style pierced earrings have been around all that long, but no matter! 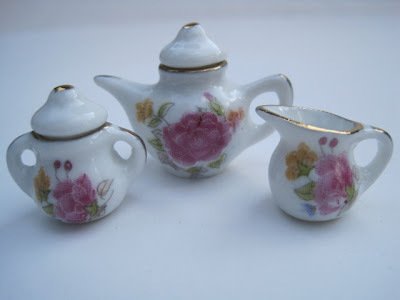 I love them, the etching around the teapot is so pretty, and the price was right. Another of my recent finds was the first piece I've found marked "FRANCE." 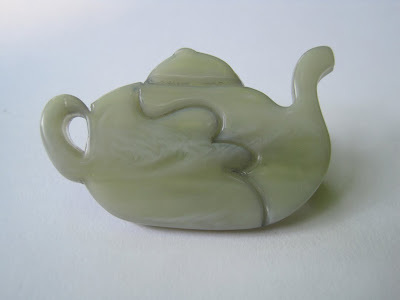 This marbleized gray teapot pin measures about 3/4 inch tall by 1-1/2 inches wide and appears to be some sort of plastic. This will come in handy for gussying up a t-shirt or lightweight sweater, since I've noticed my heavier pins tend to droop when I wear them on something lightweight. And finally, I wanted to confess that I am not a purist when it comes to my tea-themed jewelry. This lovely Brighton state charm, which represents Washington state, even says "Brighton Coffee" on the bottom, but since the design is of a little cup and saucer (with a dangling gold heart charm! and curlicues of steam!) I decided it could have a home on my charm bracelet anyway. 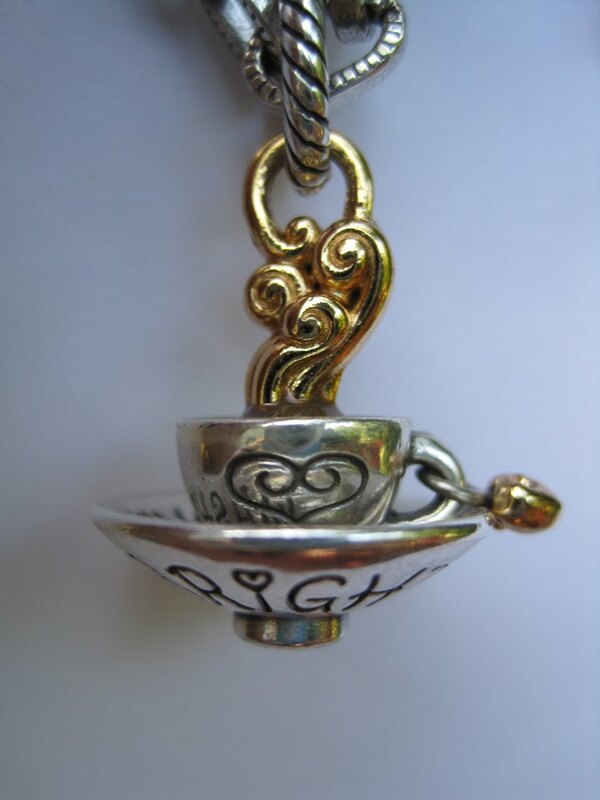 Thank goodness the cup and saucer image continues to inspire jewelry designers, because it sure inspires me! Friends, I greet this Monday as a happy woman, for my summer of deadlines ended on Friday, and I do not have another magazine deadline until October! (I started to say I feel like Mel Gibson when he shouts "Freedommmmmm!" at the end of the movie "Braveheart," but Mel Gibson analogies don't play so well anymore, do they?) At any rate, my mind is now free to think about things besides work -- like creative writing projects, catching up with friends, CRAFTING -- and so on Saturday I spent a few hours *finally* completing a half-finished project, this teapot potholder I made with leftover bits of yarn and felt. Here is a close-up of the teapot pot holder from inside the booklet, and the instructions say it was made in blue and ecru crochet thread. Now I have been crocheting since I was an 8-year-old, but I must say that I found the construction of this piece to be quite a challenge. For one thing, the designer created it in teeny tiny single crochet when it seems to me double crochet would have worked just fine. And each blessed piece of this thing had to be crocheted separately! The knob. The lid. The rim. The spout. The handle. Perhaps crocheters in 1945 were much more adept at the finishing details on a crochet project (which I don't doubt, frankly), but I really had to guess how to finish this pot holder. The instructions never tell you, for instance, how to attach the handle, so I just made it look like the picture but it would have been nice to have had a little guidance! Once all the pieces were crocheted, I did enjoy sewing on the felt cherries with the little folk-art looking stitches as shown in the book. Now if I were truly going to use this as a potholder, I would have included batting and a thicker backing material. But after all this work, this pot holder will be going nowhere near the olive oil or tomato sauce I'm likely to sling around, so instead I just backed it (somewhat sloppily, I'll admit) with a super thick piece of pink felt. I'll use this purely for decoration, or as a tea trivet, perhaps. At any rate, I'm happy to have another unfinished project move off my to-do list. Next! 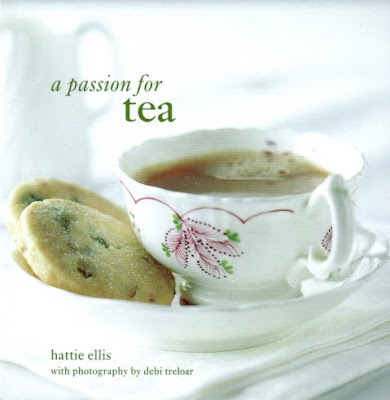 Tea and Books Saturday #34 - "A Passion for Tea"
"A Passion for Tea" by Hattie Ellis is a small gift book which retails for $9.95, but I once came across a stack of these for giveaway prices at Michaels, and several of my friends received this bargain book as a result! If you're looking for a gift for a new tea friend and want the shortest book with the clearest, simplest explanation of the history and production of tea, this is it. In a section on buying and storing tea, Ellis writes that tea is best kept fresh in larger quantities. Don't know that I've come across that before. (Do know that I probably won't be buying my own tea in any larger quantities. I have too large a tea stash as it is!) The book also includes a few recipes (Chai Masala, Earl Grey Punch, North African Mint Tea) and a directory of resources. One of the most noteworthy things about this book, however, is its wonderful photography (by Debi Treloar), and I think tea lovers old and new will be inspired by the dreamy, wistful quality of many of the photos. All in all, just a fun and fine little book! Now doesn't the cover of the new Tea A Magazine make you smile? 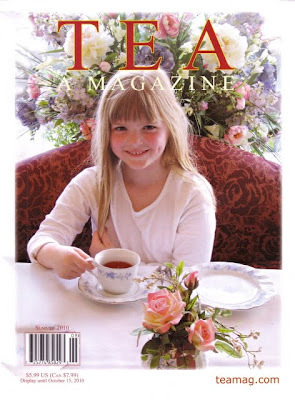 The cover girl is the granddaughter of some tearoom owners in Massachusetts, and I think she is just lovely! The tearoom shares its recipe for Tregothnan Tea Cake, and I was pleased to see that since I have had the pleasure of sampling some Tregothnan tea, the only tea actually grown in England. Editor Pearl Dexter often shares news of her own tea travels in the magazine, and this issue is no exception. She writes of going to India for a friend's wedding, and she also tells of visiting organic tea fields in southern India. At the organic nursery, she says, "Here they graft two different quality 'clonal' plants and nurture them up to 18 months before planting them in the fields. The young plants are covered by PVC to maintain humidity and temperature and to avoid frequent watering for the first seven to nine months. Then for the last several months the plants are exposed." The photos, too, are just terrific and truly make me want to visit! In addition to the tea cake this issue has recipes for Tea-Grilled Chicken Wings with Hot Green Dipping Sauce, and for Jasmine Tea and Brandied Fruit Sangria. Eve Hill has a brief but fascinating feature on Wedgwood teawares and the biblical inspiration behind some of the designs. There's a piece on Breakfast Tea blends, and there are book reviews of three new tea books I've never heard of. So if you don't already have a subscription to this informative magazine, I highly recommend either subscribing or seeking out the new issue of Tea A Magazine. 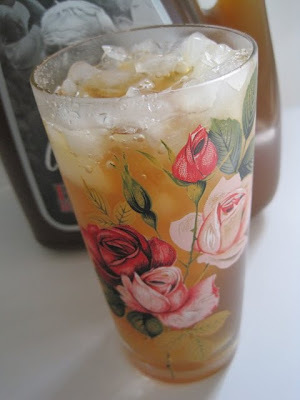 So a few years ago, I was at my friend Beth's home enjoying a fine homemade meal when she served up one of the yummiest, sweetest drinks I've ever had, a beverage she calls Lemonade Tea. Years later, I heard Food Network star Paula Deen refer to this same half-tea-and-half-lemonade drink as an "Arnold Palmer," and while I accept the fact that Mr. Palmer too enjoys mixing lemonade and tea (a swell idea), I must say I will always associate this drink with my friend Beth. 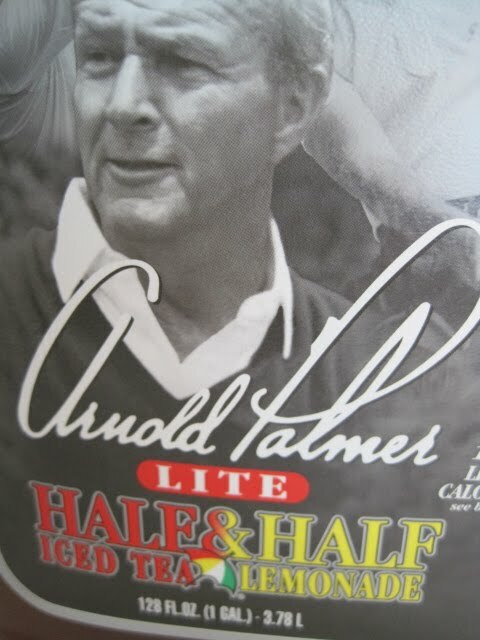 I'd actually been craving some of this tea, so I couldn't help taking home a container of this Arnold Palmer Lite when I came across it at Publix this week. 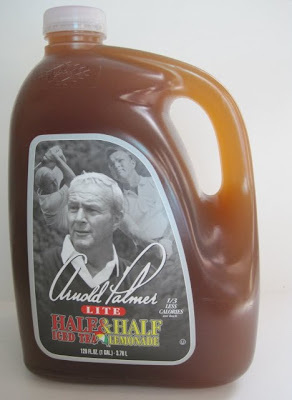 When I saw his likeness on this jug of tea, it dawned on me that pretty much all I know about Arnold Palmer, besides the fact he is a golfer, is that he likes his tea and lemonade combined. That's enough for me! And the taste? Well, it was just delicious! It's not *quite* as good as my friend Beth's, but then this is Arnold Palmer "Lite," not the regular sweet tea blend. Some ready-to-drink teas I've come across have a funky taste, but this one could pass for homemade. I'll certainly be happy to buy this again sometime. 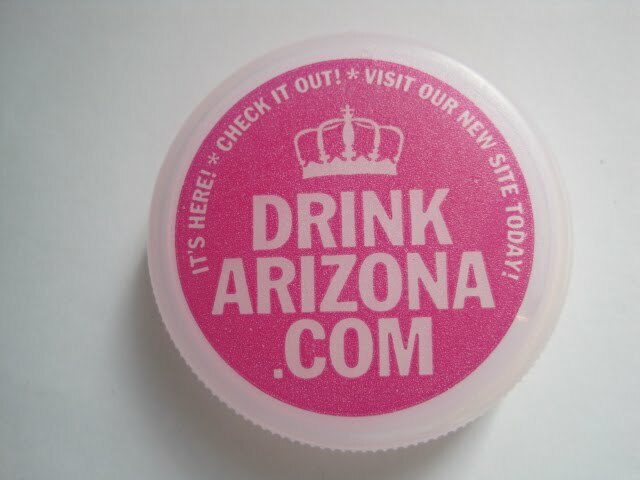 And the crown on the cap is cute too! Designs with a tea bowl and saucer always catch my attention, so naturally I was drawn to this tea towel during a visit to World Market over the weekend. This time I didn't notice any new teas I couldn't live without, but they did have a couple of tea towels I thought were nice at an extra sweet price, just $3.99 each. A lot of gift stores are now charging $15 and up for tea towels, I've observed, but these World Market versions suit me just fine! I was also interested in the new baking supplies, including silicone mini muffin cups and heart-shaped regular size muffin cups. These were just $2.49 a package, and I'm already wishing I'd gotten more! This week I have to finalize plans for our magazine's Christmas issue, and I'm seriously hoping these red and green baking cups will put me in the mood. It's kind of hard to get all fa-la-la in the heat of August, but my little trip to World Market certainly helped! Recently I had an unexpected gift in the form of an extended lunch date with my dear friend (and fellow writer) Kathy, who came to Newnan for a family visit and had a little time on her hands. We are kindred spirits in a hundred different ways, and when she reaches in her bag (as she often does) and says, "This is just a little something I picked up for you," you know it is going to be completely wonderful! 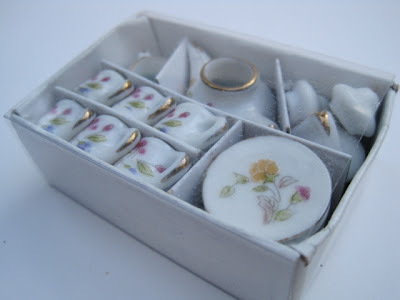 Ever since I started writing my Easter adventures featuring the tea-loving Peep sisters Emma and Matilda a few years ago, I have kept an eye out for tiny tea sets. Alas, I've come across only one, so I was extra excited to receive this sweet set from Kathy. Emma and Matilda are going to love it! This tea set is sooooo tiny, the boxed set measures just 2 x 1-3/4 inches. The teapot, for instance, is just 1-1/8 inches tall. This was a great gift, but it was made all the more special because it came from a dear friend -- and it's so lovely to be ahead on the Easter blogging for 2011! 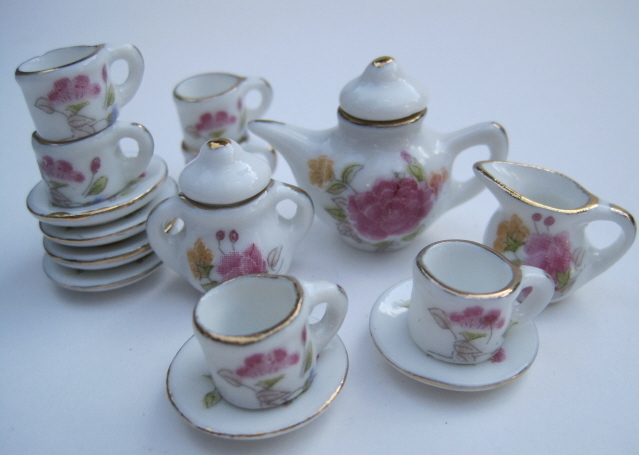 This gift also made me think about the fact I don't come across tiny little tea sets any more. Do you? If so, where? Back in the spring I picked some flowers for future crafting, and for months now I have been drying the petals between the pages of a book. This weekend, I decided it was time to try my hand at the craft I had in mind, and this was the result. I'm not sure what I'll do with it (scan the design for notecards, maybe? ), but I'm pretty happy with my inaugural effort! It seemed like I spent hours separating and pressing those violet buds and other pieces and petals back in the spring. Naturally, I realize now I should have collected about 10 times as many pieces if I truly wanted to have a good supply of "materials" to work with. Next year! My teapot was traced in pencil on a 5 x 7 inch blank canvas, and then I lightly outlined the teapot with the edge of a glue stick before arranging the pink petals. The other pieces I arranged and glued individually. So far everything still seems to be adhering pretty well. I'll eventually need to frame this under glass so the petals don't crumple and blow away. Any pressed flower crafters out there? I'm always open to instruction! 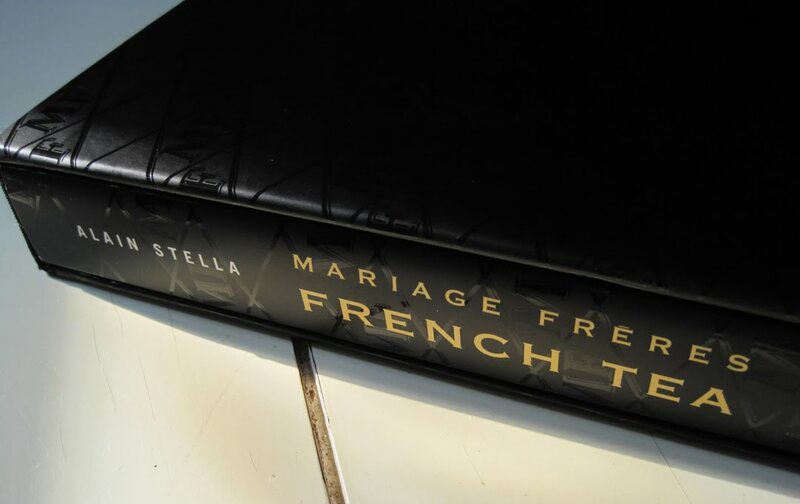 Tea & Books Saturday #33: "Mariage Frères French Tea"
Lots of women who've never been to France dream of going one day, but I'm not among them. I've simply never had a desire to go. When I went to England a few years back I could have signed up for an optional trip to Paris, but I said no thanks. It just didn't interest me. 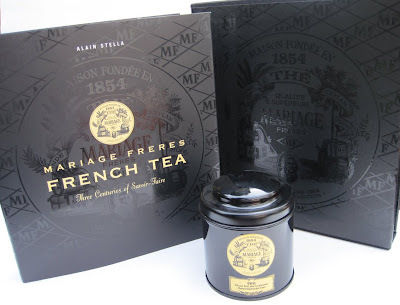 And I say all that just so you'll know that I approached the book "Mariage Frères French Tea" not as some starry-eyed Francophile but simply as someone who wanted to know more about the company's tea. Now, I'm so smitten by what I learned about French tea that a visit to their Rue du Bourg-Tibourg location in Paris is on my Bucket List and I can hardly believe it myself! When I got a generous Barnes and Noble gift card as a Christmas gift last year, I knew I wanted to save it for one big, pricey volume, and this was it. I just got around to reading the book during some quiet hours this week, and wow, what a book this is! The packaging and book design of this slipcased volume are just so lovely (the book is on the left), the book itself was fun to read, and the photography -- well, more on that later. I steeped a cup of Mariage Frères' Eros tea, the only one I've ever tried, and settled in for the adventure. If you're like me, you never see the word "Mariage" without wanting to drop an extra "r" in the middle. I'm so glad the author got that issue out of the way early on by describing the genesis of the company name. "Contrary to expectation, the name has nothing to do with marriage or nuptials of any kind. It comes from the old French verb maréier, 'to run the seas,' mer being French for sea. In a nautical context, a maréage was a sailor's contract for the run, that is to say a set wage for a given voyage regardless of how long it lasted." The family's name was spelled different ways over the years -- Marage, Maroige, Mariage, Maraige -- and eventually Mariage became the permanent choice. The book tells how the company evolved over the years, beginning with brothers Pierre and Nicolas Mariage, who were first to trade in "exotic goods." The author says that "in the 1660s, Pierre was sent to Madagascar on a mission for the French East India Company, while Nicolas made several trips to Persia and India before being named part of an official deputation sent by Louis XIV to sign a trade agreement with the Shah of Persia," and it is likely they were already interested in tea. Fast forward through a few centuries and you come to Marthe Cottin, born in 1901 to Léon Cottin and Marie Mariage. Marthe Cottin, who had no children, was the last member of the family to run the business and retired in 1983. I was fascinated to learn about her hand in the company and her selection of the two young men she found to serve as her successors and the company's new owners, the Dutchman Richard Bueno (who is now deceased) and Kitti Cha Sangmanee of Thailand. I was quite impressed to learn of the many tea customs and conventions for which we must thank these men. The categories of white tea, red tea, blue tea? 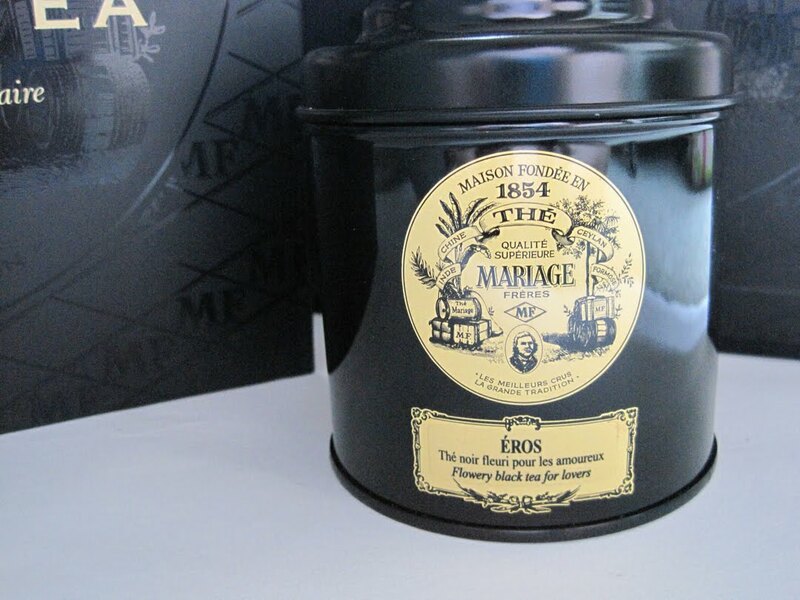 Mariage Frères was first to designate those. The use of tea as an ingredient in cooking? Mariage Frères was first to try it (and the book includes a few of their recipes). Tea-scented candles? Mariage Frères was first to create some. Because this book is larger than the usual volume on tea (about 10 x 9 inches), the wonderful photography is shown to great advantage. When I got to page 37 and saw Francis Hammond's magnificent photograph of a Thai Beauty tea leaf, I literally sat and stared in amazement. I've seen (and taken) so many bad photographs over the years, I am extra appreciative of good photography. How on earth he got a single tea leaf to pose so brilliantly, so seductively against that black-black background I'll never understand. Bravo! I ended my reading of this truly amazing book with, of course, an armchair visit via the website of Mariage Frères. Until I can get to Rue du Bourg-Tibourg, it will have to do. I mean, really, who *doesn't* want to go to France one day? A final note: I do have one beef with this book, and it's not with the subject or the author -- it's with the publisher, Flammarion. Now I am truly a "gentle reader" of my books, taking care to handle them properly, not wanting smudged or crinkled pages or broken spines. So I was not happy to find the poorly-sewn and glued pages of this book separating from the spine as I read it! 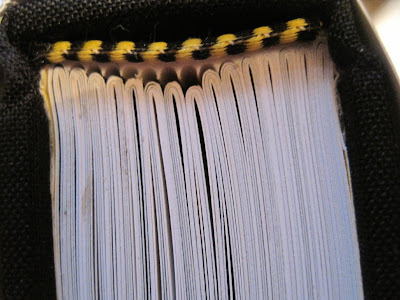 For a brand new, $50 book, this is totally unacceptable, so if I had it to do over I would buy the book on the used market rather than assuming I'd get a quality book by purchasing it new. 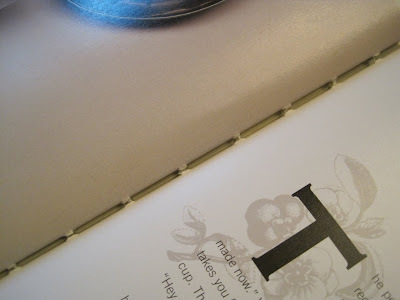 Tea and Books Saturday #32 - "Tea: East and West"